Model IA3A (2 to 6") and IA4A (2 to 12") measuring heads. This page is for reference only. Spare parts are not for sale. For repair service, refer to page 30. These are the same parts used by Interapid, Alina and SPI models 20-019-6, 20-021-2, 20-018-8, and 20-020-4 dial bore gages made in Switzerland. The parts for the dial indicator used with this bore gage are shown on a separate list. See page 84. 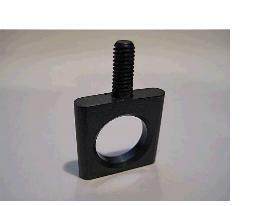 Spare parts for Compac dial bore gages are no longer available from us. You are welcome to send the gages for a no-cost repair evaluation, if you wish. Depending on part availability, repairs may no longer be possible. All parts are made in Switzerland unless otherwise noted. kit transforms 2-6" into 2-12"
contact #1 (plug) length .5" approx. contact #2 (plug) length .75" approx. centering sled (carbide) for 2-6"
centering sled (steel) for 2-6"
extension C with screw for 2-12"
centering sled (carbide) for 2-12"
centering sled (steel) for 2-12"
Sorry, we are no longer able to supply this spare part but you can send the bore gage to us for customized installation. The square shaped clamp on the 2-6" and 2-12" bore gage models which hold the extensions in place is part #040406 (see drawing item 27). This clamp is sent unfinished, which means it doesn't have an inside thread. The reason is: the thread needs to be custom cut to match the thread already in your gage head. You will need a metric M12x1 tap. A new centering sled is not necessarily easy to install. It looks like it should simply slide into the two holes but chances are that the posts won't be aligned and your sled will jam. Don't force anything and for heaven's sake don't try to bend the posts. They'll snap off. These sleds are custom fit on new gages and that's why you'll run into trouble trying to replace them. If the fit is tight, try a bit of emery and see if that works. Check that there are no burrs. Advance carefully and you'll probably succeed. The other, and better option, is to send it to us for installation. The chart above shows the various combinations of plugs (contacts) and extensions which will give you the measuring ranges for both 2" to 6" and 2" to 12" models. A similar chart is supplied in the box of new inch-reading bore gages.